One catheter. Continuous parameters on three major integrated elements – flow, pressure, oxygen delivery and consumption – for a comprehensive hemodynamic profile when used with a compatible cardiac output monitor. The clarity of a comprehensive hemodynamic profile* delivered by a single catheter to guide your treatment strategy. Advanced hemodynamic parameters provided include continuous cardiac output (CCO) and mixed venous oximetry (SvO2), in addition to right ventricular ejection fraction (RVEF) and right ventricular end diastolic volume (RVEDV), to allow continuous monitoring of the balance of oxygen delivery and consumption. Since SvO2 is considered one of the earliest indicators of a threat to tissue oxygenation2,3, continuous SvO2 monitoring may alert clinicians to a change in the patient’s condition sooner than conventional monitoring methods. *When used with a compatible monitoring platform. 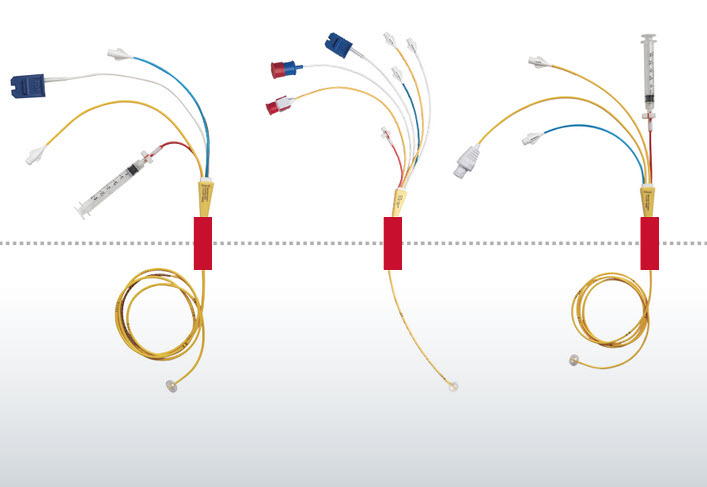 The CCOmbo V catheters are the most comprehensive hemodynamic monitoring pulmonary artery catheters in the Swan-Ganz portfolio. CCO technology helps avoid inconsistencies by providing a reproducible method of making measurements. 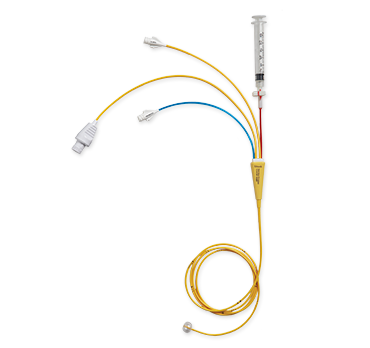 The CCOmbo catheters continuously monitor both cardiac output and mixed venous oxygen saturation when used with the Vigilance II monitor. 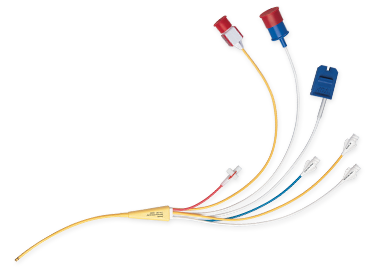 Swan-Ganz CCO/SvO2/VIP thermodilution catheters provide an additional (VIP catheter) lumen that allows for continuous infusion. To measure cardiac output continuously, the Vigilance II monitor uses thermal energy emitted by the thermal filament located on the catheter to calculate cardiac output using thermodilution principles. When used with a compatible monitoring platform, CCO catheters allow for continuous calculation and display of cardiac output. The Vigilance II monitor uses thermal energy emitted by the thermal filament located on the catheter to calculate cardiac output using thermodilution principles. Swan-Ganz oximetry TD catheters enable monitoring of hemodynamic pressures, bolus cardiac output, and continuous mixed venous oxygen saturation. 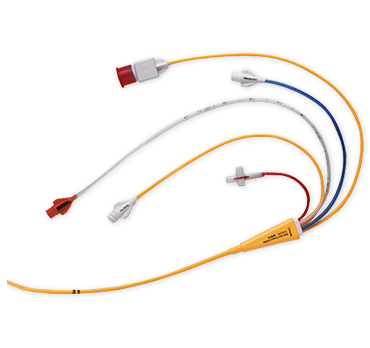 Swan-Ganz VIP oximetry TD catheters enable monitoring of hemodynamic pressures, bolus cardiac output, and mixed venous oxygen saturation and provides an additional (VIP) lumen that allows for continuous infusion. **Data on file for accuracy claims. The Swan-Ganz catheter. The clarity you need to make more informed decisions. 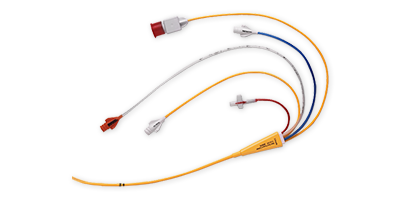 The thermodilution catheters monitor intracardiac pressures, cardiac output, and provide infusing solutions. The distal (pulmonary artery) port also allows sampling of mixed venous blood for the assessment of oxygen transport balance and the calculation of derived parameters such as oxygen consumption, oxygen utilization coefficient, and intrapulmonary shunt fraction. The Swan-Ganz VIP catheters have an extra lumen with proximal port (30 cm) for infusion in addition to the standard distal and injectate lumens to provide direct access to the right atrium. The Swan-Ganz VIP+ catheter has a right ventricular lumen that terminates 19 cm from the catheter tip and the right atrial lumen at 31 cm. The flow-directed monitoring catheters monitor right heart pressures and enable mixed venous blood sampling as well as infusing solutions. 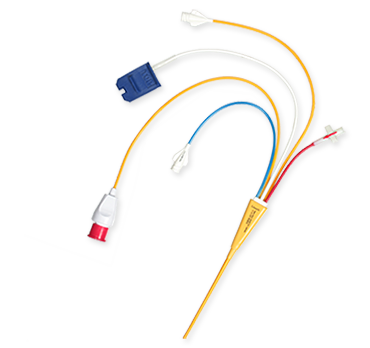 The synthetic thermodilution catheter and Intro-Flex sheath introducer kit offer a combined solution for latex sensitivities in one convenient package with no latex components. Swan-Ganz synthetic TD catheters do not contain any natural latex rubber or natural dry rubber components. 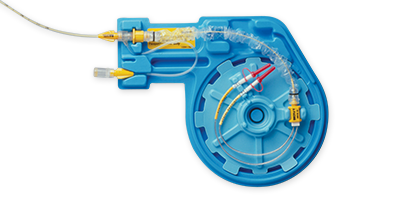 Swan-Ganz synthetic TD catheters are made from a proprietary polymer blend which offers torque control and maneuverability. 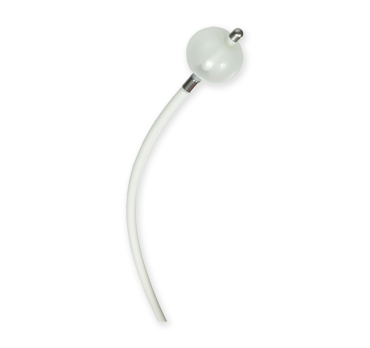 Balloon tip facilitates insertion by flow-direction. A pair of electrodes at the tip provide capabilities for bipolar pacing. "J"- tip configuration is available for femoral insertion to predispose the catheter to a stable pacing position in the apex of the right ventricle. The Thermodilution paceport catheter offers temporary transvenous right ventricular pacing† when used with the appropriate Edwards Chandler Transluminal V pacing probes. 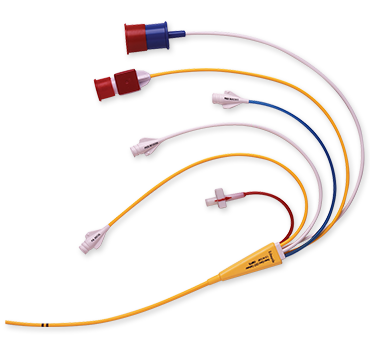 The Thermodilution A-V paceport catheter is indicated for temporary transvenous right ventricular, atrial, or A-V sequential pacing† when used with the appropriate Edwards Chandler Transluminal A and/or V pacing probes. Swan-Ganz oximetry paceport TD catheters offer bolus cardiac output and SvO2 monitoring when used with a compatible monitor in addition to temporary transvenous pacing when used with the appropriate Edwards Chandler Transluminal V pacing probe. Pacing-TD catheter can measure right heart pressures, blood sampling, solution infusion, and cardiac output measurements by thermodilution when used with a compatible monitoring platform. †When used with an external pacemaker. 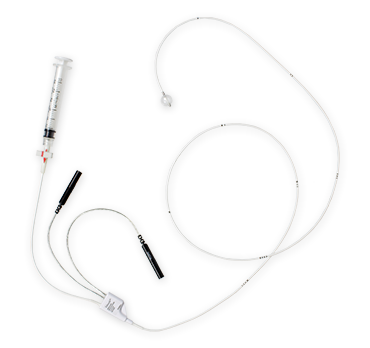 ‡When used with an external pacemaker and used with the appropriate Edwards Chandler Transluminal A and/or V pacing probes. 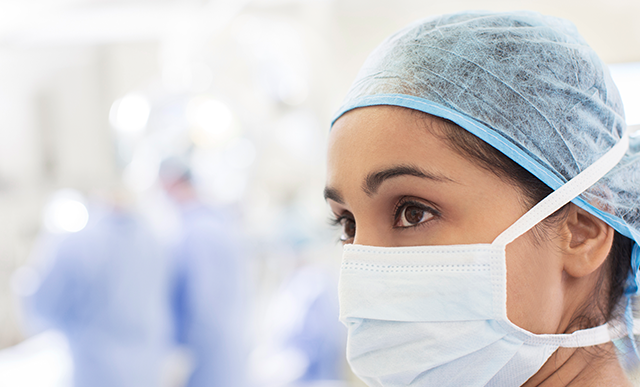 With a long-term commitment to improving the quality of care for surgical and critical care patients through education, Edwards Clinical Education meets you no matter where you are in the learning process — with a continuum of resources and tools that continuously support you as you solve the clinical challenges facing you today, and in the future. 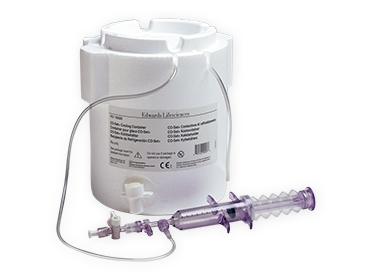 CO-Set+ closed injectate delivery system works effectively with room temperature or cold injectate for the measurement of bolus thermodilution cardiac output when used with a compatible monitoring platform and Swan-Ganz catheter. 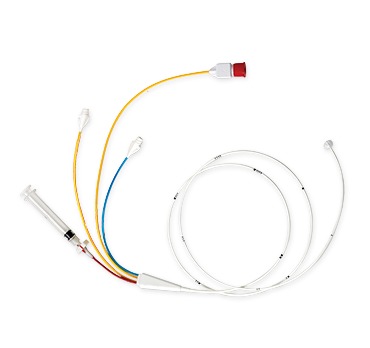 In-line temperature probe is directly in the injectate fluid path. Innovative contamination shield is integrated into the reinforced plunger to help close the system. Volume-limited syringe (10cc) aids in obtaining reproducible cardiac output by simplifying filling and eliminating the variability from differences in filling techniques. The syringe plunger and the finger grips on the syringe jacket have been designed to help accommodate a wide range of user hand sizes for efficient and comfortable injection of fluid.